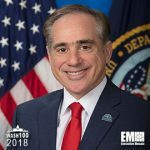 Executive Mosaic is pleased to announce that David Shulkin, U.S. Secretary of Veterans Affairs, has been inducted into the 2018 edition of the Wash100 — Executive Mosaic’s annual selection of the most influential voices in the government contracting arena — for his work in providing transitioning service members and veterans access to healthcare services. The “Supporting Our Veterans During Their Transition from Uniformed Service to Civilian Life” order calls for the Departments of Defense, Homeland Security and Veterans Affairs to devise a joint action plan that will provide those military men and women in limbo with access to treatment and mental health care services. Shulkin was unanimously confirmed by the Senate in early 2017, pledging to lead the VA’s reform and transformation efforts in a push to boost veterans’ access to healthcare in the private sector. Shulkin told lawmakers that as the under secretary of health he has advocated for more cooperation between private-sector healthcare and the VA and would try to build an “integrated system” as secretary. “Veterans still tell us that even with the ability to seek care in the community, they want VA services,” he added. “I am going to be serious about making these changes and regaining that trust, and if I don’t do it, I should be held accountable, and you should replace me,” he said. Shulkin’s work with Congress on extending and reforming the VA’s Choice Card program–which grew out of 2014 legislation–allows veterans to seek private care if they face a long wait time or don’t live near a VA facility. Executive Mosaic congratulates David Shulkin and the VA for receiving this award.